I was brought up on northern European breads – light and dark rye, whole grain pumpernickel, all those heavy, dense, delicious breads. In that era, the local milk bar only ever had the white fluffy stuff. I was enough of a kid who wanted to fit in that I was delighted when that was all we could get – anything to take something to school that looked relatively normal. But while it was a “treat”, I knew it wasn’t really bread. What I truly loved best was the fresh-baked caraway rye from the local German baker. Geelong had quite a substantial German community and there was a good supply of local and imported Northern European breads, since no true German wanted anything to do with that white sliced stuff. I’ve experimented a bit with baking really dense, soft wholegrain breads, and will come back to that soon. But there’s a lot more to Northern European breads than that. My interest in this area took me to the Nordic Baking Book, which has a whole range of fascinating breads and other baked goods from all kinds of obscure places right through Scandinavia. The problem with it is that it is one of the most confusing cookbooks I’ve ever tried to use. The recipes I’ve done have NO baking times. Basically, it’s cook until it’s cooked. For today’s recipe, it said preparation and baking time 1 1/4 hours. No two cooks have the same prep time for any recipe. It’s not even clear when prep time starts – is it after every ingredient is measured out and placed ready to be used on the bench? If you have to heat something and to allow it to cool, does it include any of that time? What degree of cooking experience is assumed? The result is that baking time is a complete guesswork. I can’t imagine what inexperienced cooks make of it. 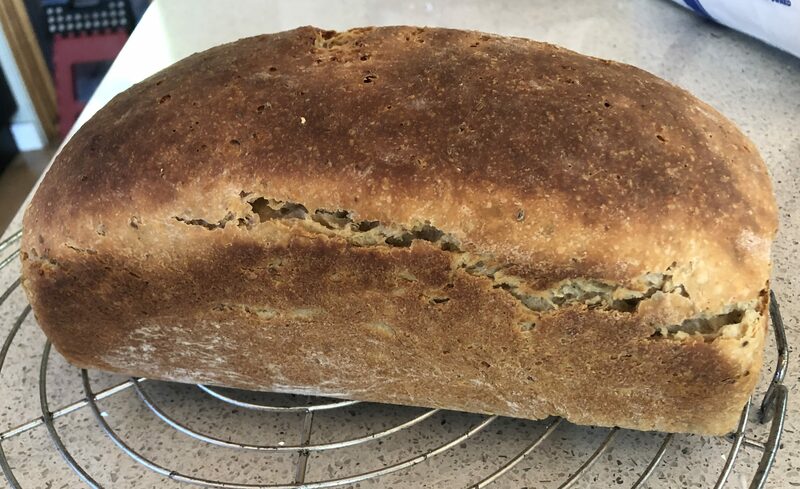 Anyway, today’s recipe resulted in the most delicious soft rye bread. A real winner. My recipe obviously is very similar to the recipe in the book, but there are some clear differences, which I will explain as I go along. PLEASE NOTE: I’ve cooked this again since originally posting it and have revised the following recipe slightly. The recipe calls for buttermilk, but any kind of cultured milk will do. I used a home-made kefir. Heat gently until butter is melted and allow to cool. • 2-3 tbs roughly ground mixed caraway, fennel, aniseed seeds, or whatever mix of that you have. It gives a lovely soft flavour to the bread. Roughly mixed and left to rise. Stir until mixed through, leave for about 15-16 hours. NOTE: I use the no-knead bread method always – leaving it to the sourdough or the yeast to do the work. For those of you who want to knead, that’s great, but give it at least 10 minutes. The worst thing you can do to bread is to knead it for just a short while. It tends to come out hard as a rock. Go for no kneading at all, or lots of it – never in between. * Sourdough/yeast: This was a major point of difference to the printed recipe. The recipe called for yeast, but I wanted a sourdough texture. 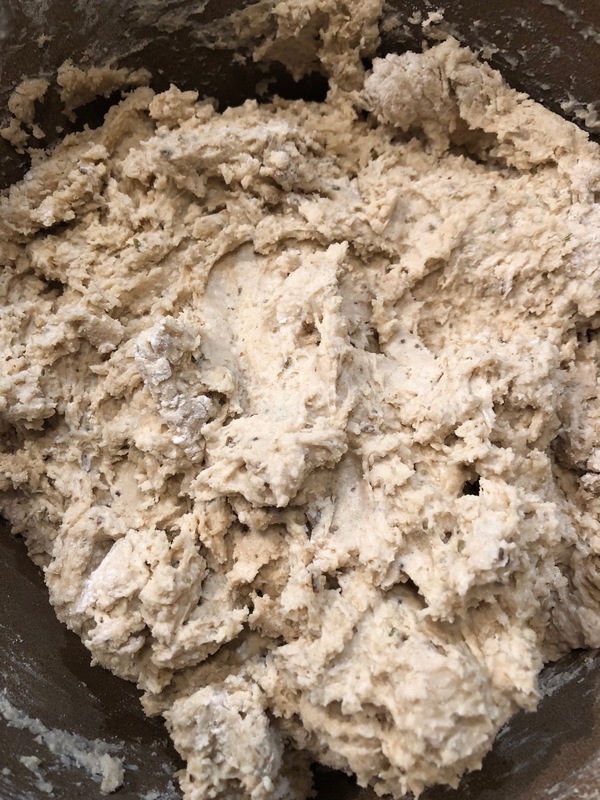 However, your sourdough – depending on all kinds of circumstances like warmth, weather and how active the mix is – might not give you as much lift you need in this quite heavy mix. So what I did was leave it for 15 hours, and then saw how much it had risen. It had risen quite well, but I added a small amount of yeast to give it a bit of an extra lift. About 1 teaspoon. If you don’t have 15 hours, or the mix doesn’t rise as much as you want and remains quite flat, just add up to a tablespoon of yeast at this point. The two-step process might seem strange but you can’t leave yeast for 15 hours while the sourdough works, and it does no harm to add it closer to cooking time. Take the dough and shape it into two loaves. Place in tins or freeform, as you please. Leave to rise about 1 hour. Cook at 195C for about 40 minutes.